Flexible Dot Stick Bituminous Marker Adhesive | Alpine Products, Inc. 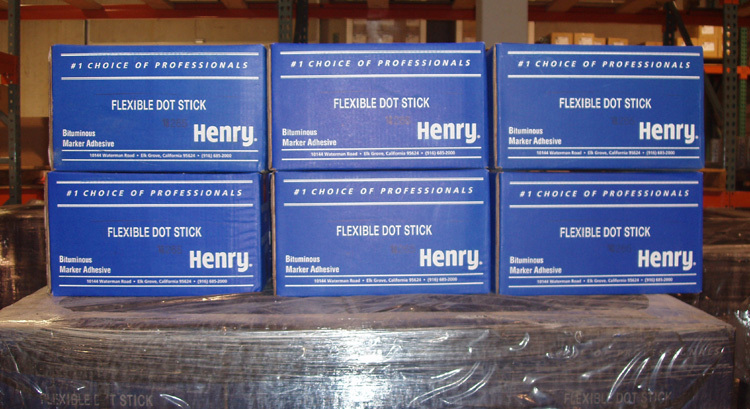 DESCRIPTION: Henry #184 Flexible Dot Stick Bituminous Marker Adhesive is a hot melt asphalt adhesive, which securely bonds pavement markers to asphalt concrete and portland cement concrete. The bituminous marker adhesive has superior bonding characteristics because of its high virgin polymer conent and low amounts of filler. SURFACE PREPARATION: Pavement Surface should be dry and free from all loose material, dirt, and dust. APPLICATION: Henry #184 Flexible Dot Stick Bituminous Marker Adhesive should be heater in a temperature-controlled applicator with agitation. The application temperature is approximately 340 degrees F. Apply the marker immediately after despensing Flexible Dot Stick, and allow to cool for one minute or more before exposure to traffic. PRECAUTIONS: Store in a dry, shaded area until ready to use. Do not allow the material to exceed 380 degrees F.
CLEAN UP: Asphaltic stains can be removed with non-hazardous, biodegradable cleaners. Use waterless hand cleaner on skin.